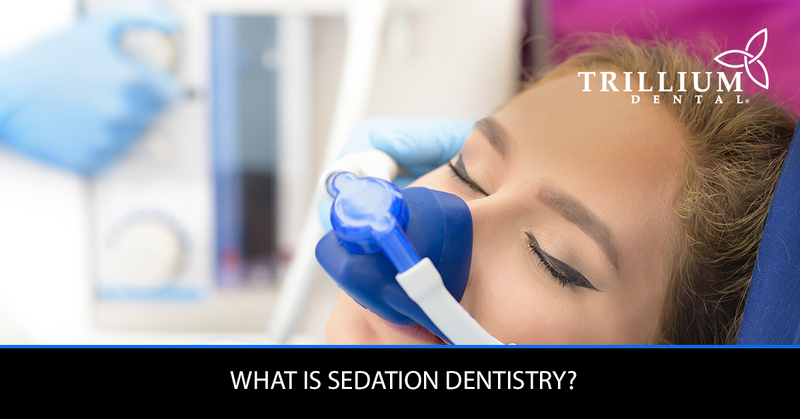 Sedation Dentistry Ottawa - What Is Sedation Dentistry? In the world of dentistry, we commonly use different types of sedation for a number of reasons. For some patients, a mild sedative is beneficial to help ease nervousness or a dental phobia, and for others, local anesthesia is used to numb areas in the mouth before undergoing dental treatment. In some cases, such as wisdom teeth removal and other forms of oral surgery, patients are put under a general anesthetic during the dental procedure. Regardless of the type of anesthesia being used, many patients express anxiety with regard to sedation dentistry, and more often than not, this is because they don’t know what it entails. At Trillium Dental in Ottawa, we strive to ensure that each and every one of our patients have a pleasant experience with us and receive the quality dental care they deserve. For us, this means not only providing them with affordable dental care that addresses all of their oral health needs, but also doing everything in our power to make sure patients are comfortable during their dental visit. Our dentists and dental hygienists believe that communication is the key to a pleasant dental experience, so for those of you who have reservations about anesthesia, “laughing gas,” and other aspects of sedation dentistry, here’s what you need to know. IV sedation stands for intravenous conscious sedation and is commonly referred to as “sleep dentistry,” though this is deceiving because patients that undergo IV sedation remain conscious. However, these patients are put in a much more relaxed state, which proves helpful for those who have a fear of dental tools, treatments, and procedures, as well as those with anxiety or a low pain tolerance. If you wish to use IV sedation during a general dentistry teeth cleaning, cavity filling, or any other type of treatment, you’ll need to arrange for a friend or family member to drive you to your dental appointment and bring you home afterward. This is because IV sedation puts you in a deeply relaxed state that renders you incapable of driving safely until it wears off after an hour or two. Another sedation dentistry option we offer at our Ottawa dental office is oral sedation, which acts similarly to IV sedation in the sense that it puts patients in a relaxed, yet conscious state during their dental treatment. The main difference is that this type of sedation is taken orally in the form of a pill, rather than being administered intravenously, where the patient is hooked up to an IV drip. As with IV sedation dentistry, patients who opt to undergo oral sedation during their dental visit must arrange for someone to bring them to and from their dental appointment, as the effects of oral sedation inhibit a person’s ability to safely operate a vehicle. Our team at Trillium Dental also recommends that someone stay with you until the effects of either IV sedation or oral sedation have completely worn off, because the last thing you’d want is to trip and fall or hurt yourself in some way at home. Nitrous oxide, also known as “laughing gas,” is a sedation dentistry technique that is administered through a small mask that is placed over a patient’s nose and mouth. Like the previously mentioned types, this kind of anesthesia helps patients relax without rendering them unconscious. Rather, it eases any stress the patient might be experiencing before their dental treatment, which makes the overall experience much more pleasant and comfortable. The effects of nitrous oxide are calming and wear off soon after the mask is removed, so patients do not necessarily require someone to take them home after the dental treatment is complete. However, our dentists and dental hygienists believe that it’s always best to air on the side of caution, so please don’t hesitate to ask a friend or family member to accompany you to and from our dental clinic. Unlike the three types of dental sedation mentioned above, general anesthesia puts patients “to sleep” or “knocks them out” during the duration of their dental treatment. This type of sedation dentistry is often used during wisdom teeth removal and dental implant procedures, as these tooth extraction procedures would be far more complicated and unpleasant for patients if they were awake. When you meet with your wisdom teeth removal specialist and anesthesiologist, they will explain how the procedure works, what to expect during recovery, and how the general anesthesia will be administered. Common techniques for this type of sedation include total inhalation anesthesia and total intravenous anesthesia, both of which put the patient in a safe, unconscious state. When patients come out of general anesthesia, it is not uncommon for them to feel “loopy,” “silly,” or otherwise disoriented, so it is mandatory for them to have someone transport them to and from their dental appointment. This brings us to the last type of sedation dentistry we use here at Trillium Dental, which is local anesthesia, or the numbing of certain areas in the mouth during a dental treatment or procedure. Local anesthesia is commonly used to numb the treatment area around tooth cavities or a damaged nerve in the tooth, which is removed during a root canal treatment. In either case, a shot of local anesthesia is administered around the treatment area to help prevent any discomfort when a patient gets a cavity filling or an infected tooth pulp removed. Not only does local anesthesia help prevent the patient from feeling any pain during these types of dental treatment, but it also makes their overall dental experience much more comfortable. We hope that this post has answered some of your questions regarding the different types of sedation dentistry and how they are used at our Ottawa dental clinic. Our philosophy is to provide the best dental care possible for all of our patients, and sometimes, that means providing them with a mild sedative to calm their nerves and ease any fear they may have. As a family dental clinic, there is nothing more important to us than the comfort, happiness, and well-being of our patients, so we do everything in our power to help make that happen. Interested in trying a method of sedation dentistry during your next dental appointment? Contact us today to learn more, or book your appointment online at Trillium Dental in Ottawa!